Anti-Theft Device . . . 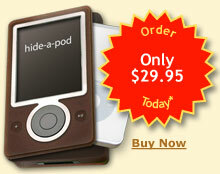 Hide it in a Zune*! Can I choose my Zune color? Sorry, no. We only use brown Zunes for the maximum anti-theft protection. How can you do this so cheap? There were a lot of disappointed kids last Christmas who wanted an iPod but were given a Zune by some well-meaning friend or relative. Consequently, there is a glut of Zunes available on eBay every day. We buy ‘em cheap and throw away the guts to make our product at a great price. Will all iPod models (and iPhone) fit? Of course! The Zune is so incredibly huge that there’s plenty of room for any iPod or iPhone along with your choice of accessories, a sack lunch, and maybe a small cat. Do you make the Zune control wheel scroll the iPod? The Zune control wheel is a fake. Get over it! The Zune looks like it has a scroll wheel on the front but it’s just a round hunk of plastic with a few buttons under it. There’s not much we can do about that. Does my iPod gain any of the Zune features? We leave the Zune’s wifi circuitry in place, but disconnected. It will then work just about as well with your iPod as it does with a regular Zune. Do I get the Zune headphones too? Of course. Getting rid of those shiny white ear buds is a key part of the anti-theft system. We provide the original brown earbuds because we certainly don’t have any other use for them. Read stories from our happy customers and add your own. Suffering with a “Zune” of a Web host? Hide-a-Pod is hosted by Site5. They've done a great job handling our traffic. You get lots of storage and bandwidth for a great price. We encourage you to check them out for your own hosting needs. *iPod and iPhone are trademarks of Apple and Zune is a trademark of Microsoft. We are are not associated with them in any way. This is all just a big gag and you couldn't order a Hide-a-Pod if you wanted to. So there. Hide-a-Pod is proudly powered by WordPress. Feeds: Entries (RSS) and Comments (RSS).